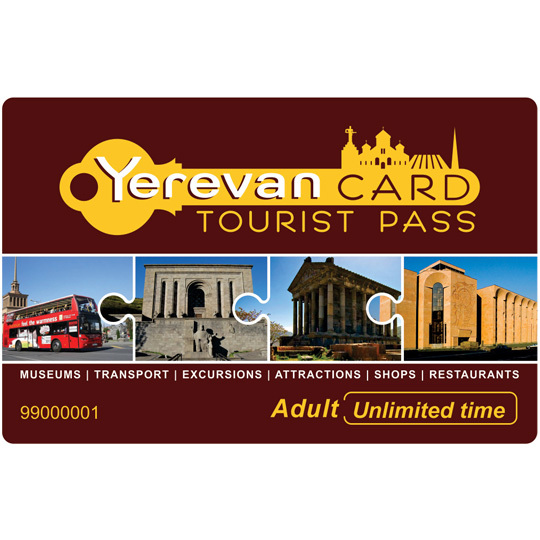 "Yerevan Card" is a official city pass designed for tourists The package includes an e-Card, a guidebook and map of Yerevan, a SIM card, a transfer coupon, travel coupon and a badge. According to the prescribed period, it gives a free single access to Yerevan museums, places of entertainment and local excursions. 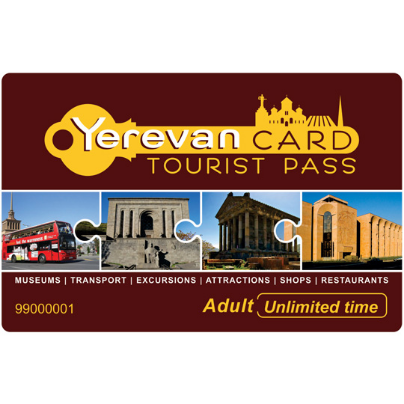 Yerevan Card gives a single entry access to various museums, excursions and entertainment venues (free or discounted) that are included in the program. 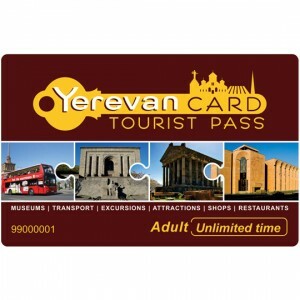 With Yerevan Card you will get discounts from partner organizations. There are 4 types of cards – 24h (1 day), 48h (2 days), 72h (3 days) and card with unlimited time, which is valid for one year. You can activate your card within 12 months after the purchase. The card is activated after the card owner or the employee of the museum; attraction or entertainment venue writes the cardholder's name/surname, activation date and time on the card and scans it using the terminal (card reader). After the activation the program starts counting the hours based on the card type. Card deactivates free entries after the expiry of the time limit, but you can still enjoy discounts and special offers for a whole year.